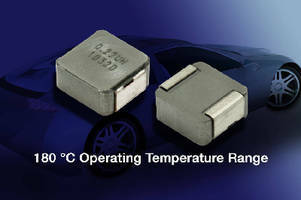 High-Current Inductor operates up to 180°C. Supplied in 3232 case size withÂ 4.0 mm profile,Â Model IHLP-3232DZ-8A provides inductance values from 0.22–33 ÂµH. Unit features frequency range up to 2 MHz and exceeds AEC-Q200 requirementsÂ for DC/DC converters and high-current noise filters in high-temperature automotive systems. WithÂ 100% lead-free shielded composite construction,Â RoHS-compliant inductorÂ isÂ specified for operating temperature of 55 to +180Â°C, with resistance to thermal/mechanical shock, moisture, and vibration. MALVERN, Pa. – Vishay Intertechnology, Inc. (NYSE: VSH) today introduced a new automotive-grade IHLP® low-profile, high-current inductor in the 3232 case size that is the industry's first to feature high continuous operating temperatures to +180 °C. Offering a low 4.0 mm profile, the Vishay Dale IHLP-3232DZ-8A provides a wide range of inductance values from 0.22 µH to 33 µH. With a frequency range up to 2 MHz, the device released today exceeds AEC-Q200 requirements to provide a high-performing, space- and power-saving solution for DC/DC converters and high-current noise filters in high-temperature automotive systems. Applications include engine and transmission control units, diesel injection drivers, noise suppression for motors, windshield wipers, HID and LED lighting, and heating and ventilation blowers. The IHLP-3232DZ-8A handles high transient current spikes without hard saturation. Packaged in a 100 % lead (Pb)-free shielded, composite construction that reduces buzz noise to ultra-low levels, the device is specified for an operating temperature range of 55 °C to +180 °C, with high resistance to thermal shock, moisture, mechanical shock, and vibration. The inductor is RoHS-compliant, halogen-free, and Vishay Green. Samples and production quantities of the new inductor are available now, with lead times of 10 weeks for large orders. Pricing for U.S. delivery only in 10,000-piece quantities begins at $0.70 per piece.